Microsoft Identity Manager (MIM) 2016 is the identity and access management on new platforms, it helps to manage the user's, credentials, policies, and access within your infrastructure, it is advance version of FIM 2010 with new functionality included. MIM 2016 also a hybrid potential, privileged access management capabilities. Advance to FIM there are many additional functionality included, MIM 2016 provides new enhanced features, below are few of them. It includes new function for self-service for Account unlock and password reset and cloud (Azure) Multifactor Authentication (MFA). Privileged Identity Management controls and manages administrative access by providing temporary, task-based access to sensitive resources. You can give users only as much permission as necessary, which lowers the chances of a cyber attacker gaining full administrative access. In addition, Privileged Identity Management extracts and isolates administrative accounts from existing Active Directory forests. it supports an on-premises Privileged Identity Management solution for managing Active Directory. MIM 2016 works together with Azure AD to give you control over your on-premises and cloud. Hybrid reporting in Azure AD presents your cloud and on-premises data in one place. It will give you ability to Self-Service Password Reset portal supports Azure multi-factor authentication (MFA). 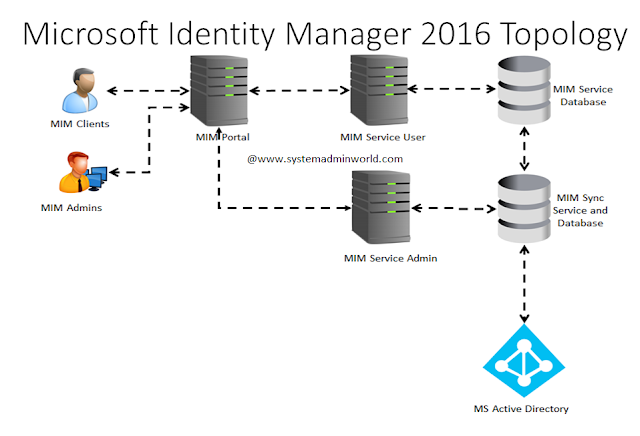 You can install and configure Microsoft Identity Manager (MIM) on standalone server or on multiple servers in multiple configurations. The topology that you select for your deployment affects the performance that you can achieve from MIM. This article introduces multiple deployment topologies that you may consider implementing. When you designing your topology, you should know about each component involved and how they all interact with each other. Below are list of component which are part of multitier topology. Microsoft SQL Server - MIM Service and MIM Sync Service both store their data in SQL databases. MIM Service - a web service that implements MIM 2016 identity management functionality. MIM Synchronization Service - Synchronizes data with other identity systems. MIM Portal - an interface for password resets, group management, and administrative operations. Microsoft Windows Server 2019 Release- What's new in?? ?